My son once told me, “Cars are like shoes and trucks are like boots.” I’ve reveled Caleb’s natural, sixth sense of categories since he was 9 months old. I remember reading one of his picture books together and he pointed eagerly to a bar of soap and washcloth on the page. He immediately closed the book, grabbed my hand and insisted we walk down the hall to his bathroom where there was also a bar of soap and washcloth draped over the tub. Words weren’t even necessary for me to know he’d connected the dots! I’m so comforted to know that God understands the stages of life – and proves Himself all sufficient through them all. God, who’s original plan was not that we should die, for that is what sin brought into this world. Yet He never turns His back on us and is there to heal every hurt this fallen world inflicts. I praise Him for that! Throughout this past week of witnessing the last days of my grandmother, I see so many parallels to the beginning of life and the end. And Ecclesiastes confirms there’s a time for both. God has appointed for us all a time to live the life He’s given us and a time when He calls us home. There was a time my grandmother would’ve healed from a shoulder injury, but this time she didn’t. (vs. 3) There’s a time to search out the answers to life’s questions and a time to just let it be. A sweet friend told my tearful, apologetic Grandfather, “It’s OK to cry. It’s a time to cry.” (vs 4) And it is! I’m so thankful God is with me – us, in our time of mourning. We won’t mourn forever, because it says in Psalm 30:11 “You turned my wailing into dancing; you removed my sackcloth and clothed me with joy.” I can rejoice in so many things, – memories, friends, but most of all because God is good. His goodness endures forever. 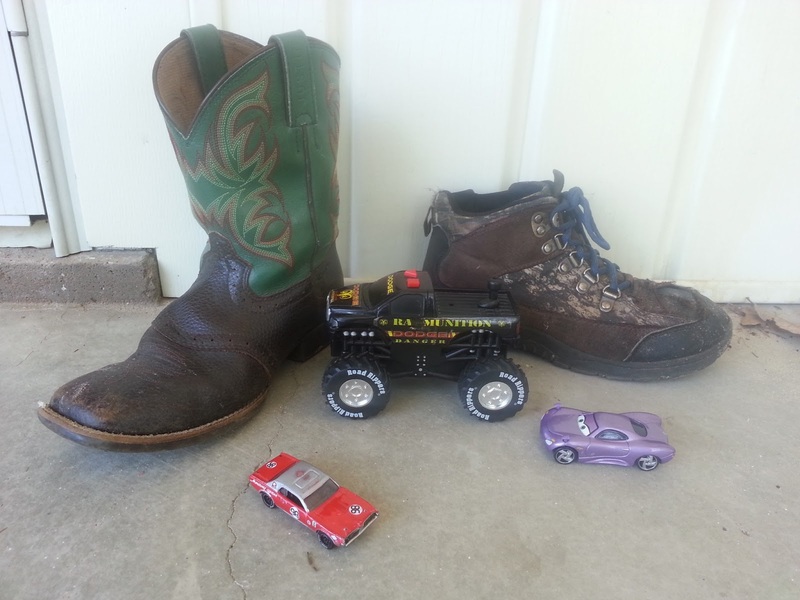 Caleb’s cars, trucks, boots and shoes will soon be in the “time to throw away” category, but those who trust in the Lord may fall asleep in this world, but awake to an eternal home that never spoils, fades or perishes!! Amen! Yes. These past couple of weeks have been times of great sorrow, yet even greater comfort. We thank everyone who has shared in our sorrow and brought us such comfort.